Joseph S. Pedler was born on a farm in Gray county, Ontario, May 30, 1857. He was the eldest of two sons in the family of Samuel and Sarah Sparks Pedler, His mother died in 1861, when he was only four years old. His father remarried, and of this marriage eleven children were born. Out of this large family, Joseph and a half-brother, H. W. Pedler, were the only ones who came to the United States. Mr. Pedler spent his earlier years on a farm, receiving but little schooling, and in his seventeenth year, he started out in life for himself, learning the blacksmith trade. It is a curious fact that as far back as the family history could be traced, some member of the Pedler family has been a blacksmith or iron worker. Mr. Pedler first received forty dollars per year and board. In 1879, he emigrated to Newton, Iowa, and worked at his trade there for about a year, going to Loup City, Sherman county, Nebraska; in May, 1880. In the following July, he was married to Miss Mary A. Thompson, in Grand Island, Nebraska, coming to the Loup City home immediately after the marriage. Mr. Pedler was elected sheriff of Sherman county in the fall of 1885, and after serving in that capacity for two terms, was deputy sheriff for two years. While he was serving as sheriff, there was considerable excitement over the shooting of Editor B. L. Richardson of "The Loup City Northwestern" by Editor O. B. Willard of the "Sherman County Times." During these years, Mr. Pedler had began the study of law and in December, 1893, he was admitted to practice law in the Nebraska courts. Three years later he became a partner of ex-County Judge G. W. Hunter and since that time has given most of his time to the practice of his chosen profession. For four years he was county attorney of Sherman county, and was county judge in 1908-9. Notwithstanding his extensive law practice, Mr. Pedler has also had much to do with the financial and business life of Loup City and central Nebraska, being president of the Loup City State Bank. He is an active, progressive man of affairs, especially prominent in educational lines, For about fifteen years he has been continuously on the Loup City school board, and served on the board previous to that time. During the past year he has been a member of the city council. He has attained the thirty-second degree in Masonry, and is a member of other lodges and orders. Mr. and Mrs. Pedler have had two children, Raymond and Saidee, neither of whom is living. They have a comfortable home in Loup City, and enjoy the respect and esteem of many friends. Mr. Pedler has been in Nebraska thirty years and is reckoned as one of the pioneers. He remembers the time when plow shares were brought to him from a distance of fifty miles to be sharpened and when he made some of his tools out of old horseshoes and files. In compiling a list of the representative farmers of Cedar county, Nebraska, a prominent place is accorded the name of August W. Muller, who has been for many years engaged in agricultural pursuits. He has been a resident of the county since 1880, and in that length of time has won a secure place in the community, being now regarded as one of the most prosperous farmers of that locality. Mr. Muller is a native of Germany, having been born in 1841 in the province of Anhast Dessau, the son of Carl and Fredericka Muller. His childhood and the years of his early manhood were spent in the land across the sea, and in 1864, he was united in marriage to Miss Augusta Prummer. The following year, 1865, he decided to cast in his fortune with the new world, and accordingly started from Hamburg in a steamer bound for New York. From this city he came direct to Pennsylvania, where he remained until 1880. At this time, he joined the throng who were moving westward, and came to Cedar county, this state, where he took up a homestead in section twenty-one, township thirty-one, range two, east. He has occupied this place continuously since that time, and has now a well-improved farm, with comfortable house, commodious barns, and convenient buildings. Since coming to Nebraska, Mr. and Mrs. Muller, with their one daughter, Emma, have taken a prominent part in the social life of the community and enjoy the respect of all who know them. A man's part has been played in the making of Merrick county, and conversion of the shining prairies of Nebraska into fertile and well kept farms by him whose name begins this article, and whose home is in Central City, where he owns a good home and is enjoying the fruits of his early efforts. where he resided until the civil war broke out. On October 20, 1861, Mr. Gosnell enlisted in Company H, Third Iowa Cavalry, and served all through the war, receiving an honorable discharge August 20, 1865, in Davenport, Iowa. The principal battles engaged in were Moore's Mills, Missouri; Kirksville, Missouri; Hartville, Missouri; Cape Girardeau, Missouri; Little Rock, Arkansas; Gun Town, Mississippi; Tupelo, Mississippi; battles of Big Blue, and of Little Blue, Missouri; Plantersville, Alabama; Selina, Alabama; Columbus, Georgia; and many minor skirmishes, including the, Wilson raid, which began at Gravelley Springs, Alabama, and ended at Macon, Georgia, where it was learned that General Lee had surrendered and the war was over. After the war, Mr. Gosnell went to Louisville, Kentucky, and engaged in the retail ice business for four years. In January, 1869, he wentto Vermillion county, Illinois, farming for three years, and in March, 1872, came to Merrick county, Nebraska, homesteading one hundred and sixty acres of land in section twenty-two, township thirteen, range eight, which remained the home place for thirty-eight years. During all the years Mr. Gosnell's sister, Mrs. Margaret Fauquier, lived with him, until July 12, 1883, when he married Mrs. Augusta Bruno of Michigan and later of Nebraska. Mr. and Mrs. Gosnell have had four children: Susanna A., Thomas N., junior, Frances S., and Annetta, all of whom are living under the parental roof. Mr. Gosnell in political faith is a democrat, and has served as supervisor of his county for ten years; also justice of the peace in Prairie Creek township eight years; and was instrumental in organizing his school district number twenty-eight, and served as director of same for a number of years. In 1908, Mr. Gosnell was elected to the office of county assessor, which he is now filling satisfactorily. In March, 1910, Mr. Gosnell retired from the farm and moved to Central City, and purchased a good home where they now reside. Mr. and Mrs. Gosnell have passed through all the trying experiences and hardships of frontier life and are widely and favorably known. John C. Luckert is one of the pioneers of Knox county who has been an important factor in the development and growth of the region where he has spent the past thirty-three years. He has extensive ranching and farming interests, nearly all of which has been acquired by dint of his own energy and perseverance. He is well known throughout the county and enjoys the confidence and esteem of all. Mr. Luckert is a native of Pennsylvania, his birth occurring in the year of 1842. Later the family came to New York state, settling on a farm, where our subject was reared and educated, attending the country school when assisting in the farm work on the home place. During the civil war, on April 7, 1861, Mr. Luckert joined the army, enlisting K, Fifth New York Zouaes. He served under many distinguished generals - Grant, McClelland, Burnsides, and others - and fought until the close of the war, June 19, 1865. After two years, Mr. Luckert became a member of the One Hundred and Forty-sixth New York Volunteer Infantry, and remained with that regiment until the close of the war. After the memorable seven day fight, at the close of the war, he attended West Point academy for one hundred and ten days. He then enlisted in the regular army and went to Cheyenne, Wyoming, where he remained a short time, then going to Arizona, where he served until 1868, being seven years and four months in the government service continuously. In 1872 he was re-instated in the regular army as quartermaster, Company K, Sixth United States Cavalry, and served five years more. He then drove from Cheyenne, Wyoming, to Columbus, Nebraska, with a mail man, and there hired a man to birng him to Knox county, his advent to this county occurring in the year 1878. Here he bought the O'Neil homestead of one hundred and sixty acres, which was all improved farm, and thirty head of cattle, and horses, all for five hundred and fifty-six dollars. Later he took up a pre-emption timber claim. In his thirty-three years' residence in Knox county, Mr. Luckert has experienced many vicissitudes and discouragements, not the least of which were prairie fires, which our subject fought many times to save his home and possessions. Deer and antelope were plentiful in those early days of the first settlers in the county, and many dangers beset the sturdy pioneer of that time; but success has crowned the faithfulness of those who would not become discouraged, and now Mr. Luckert owns six hundred and forty acres of fine land, and is a highly respected member of his community and county. In 1880 Mr. Luckert was married to Miss Julia Whitt, and Mr. and Mrs. Luckert are the parents of fifteen children, of whom eleven are living: Herman, Lillie, Julia, Rudolph, Bertha, Oscar, Elsie, Alma, Walter, Alton, and Loal. Those who are dead were: William, John, Hugo, and Herbert. and he enjoys a splendid reputation as a worthy citizen and progressive agriculturalist. Mr. Turner was born in Columbiana county, Ohio, December 27, 1859. He was the third in a family of five children resulting from the marriage of Robert and Mary Turner. His education was received in the Salem city schools, and he made that section his home until his nineteenth year, at which time in company with John, Charles and Frank Hinchilwoo and Jacob H. Umstead, came into Nance county, Nebraska, our subject and Mr. Umstead purchasing one hundred and sixty acres in partnership and each forming one-half of this tract. Mr. Turner afterwards sold his eighty to his partner, and bought one hundred and sixty acres on section thirty-three, township seventeen, range six, which has remained his home place up to the present time. He has added to his acreage, now having two hundred and forty acres, all situated in Cedar Valley, and is choice farming land, which he has in a high state of cultivation, and he is also engaged in the stock business to quite an extent. Mr. Turner was married in Fullerton, Nebraska, March 3, 1885, to Mary D. Tredway, daughter of Abraham Tredway, one of Nance county's pioneer settlers, he coming here from Iowa with his family in 1882. The father, mother and two sisters of our subject joined him in Nance county in 1890, locating in Fullerton, where the father died the following year, and the mother in 1900. One sister is also dead, one other, Mrs. W. D. Dean, lives on a farm near our subject, and another Mrs. George McChesney, resides in Belgrade, Mrs. Turner died on the home farm, June 29, 1900, leaving four children; Robert A., Arthur C., Mildred and Miles, (twins). The first two and the last named live at home; while Mildred is married to Ed L. Hunscote and resides near Clarks, Merrick county. The entire Turner family is well known throughout Nance county, and enjoy the friendship of a large circle of acquaintances. John A. Henning, a retired ranchman and one of the wealthy land owners of Holt county, Nebraska, is a native of the village of Fosdorf, Prussia, Germany, born April 27, 1851. His father died when he was a small child and his mother later married Fred Kohlman, who came to America in 1861. Her maiden name was Lena Schumacher. The family sailed from Hamburg, May 15, and landed at New York July 4, meeting a noisy reception in that city. Mr. Kohlman located in Cook county, Illinois, renting a farm for a number of years, and there John A. Henning received most of his education. At the age of sixteen years Mr. Henning began life on his own account, and until reaching his majority worked on farms by the month. He then rented a farm near Hoopeston, Vermillion county, and continued living on leased land until leaving Illinois in 1881. January 20 of that year he started went and some time the following month reached Marion, South Dakota, where the deep snow of the preceding part of the winter had blockaded the roads, and travelers were held there three months waiting for traffic to be resumed on the line. They finally reached Running Water about the first of June, crowed the river to Niobrara, and drove horses thence to, Holt county. They were eight days making this journey, as the spring floods had been heavy and had washed away many bridges, and heavy rains had followed, so that their only way of crossing streams was to go to the headwaters, They were held three days at one ranch house, Mr. Henning camping in his wagon, while his wife and the children sought shelter in the house, with nearly a dozen more. On the tenth of the month they reached their destination on Eagle creek, twelve miles northeast of Atkinson. Mr. Henning filed on a homestead and timber claim, to which he completed his title, then began buying the surrounding land until he owns two thousand acres of as valuable land as is to be found in the state. It is well adapted to farming and cattle raising, has an abundant supply of good water, and whether used for grazing purposes or cultivated, yields a bountiful profit. From the first he engaged in stock raising and dealing, bought and shipped stock and fed all the grain he raised to his stock also buying more grain for feeding purposes. He remained on his ranch until 1903, then purchased a comfortable town residence in Atkinson, where he has since been enjoying a well earned rest from strenuous work, although he finds much to occupy him in caring for his various interests. Three sons were born to Mr. Henning and wife: Henry and Albert occupy parts of their father's land on Eagle creek, while John has a farm eight miles northeast of the city. At the time of the famous blizzard of January 12, 1888, Mr. Henning happened to be in the barn when the storm broke, and several times during the day made the trip from house to barn and back again, making sure that the cattle were weathering the blast comfortably, and attending to numerous other details. Although many people lost their lives going a short distance from one dwelling to another a short distance away or from house to barn, or vice versa, he was fortunate enough to make these several trips in safety, although he well remembers the severity of the storm. When the family came to settle on Eagle creek, deer and antelope were still to be seen and along some of the streams wild turkey were plentiful. They were undisturbed by the Indian scare for the very simple reason that they knew nothing of it until it was over and everything was quiet again. Mr. Henning and wife are among the most popular and well known residents of their community, where they are highly esteemed and have many warm friends. They have lived long in the county and are well known, their many good qualities being for this reason widely appreciated. In compiling a biographical history it rarely occurs that we find an individual sketch so rich with incidents as the following. The writing of a story is simple enough, but when one has actually experienced the incidents related therein, it adds very much to the interest. Charles C. Combs was born in the town of Verick, Seneca county, New York, October 23, 1832, the fourth child of Charles and Sarah (Waters) Combs, who had four boys and three girls. Our subject's mother was a native of England, and the father a native of Scotland. They were married in New York state in 1815. The father came to America prior to 1812 and was a soldier in the war of 1812, his son, Charles, now having the original discharge papers of his father. Charles Combs, senior, died in Seneca county, New York, in 1838, and about 1842 the Combs family began to separate. Charles C. Combs left New York state in March, 1852, going to Adrian, Michigan, where he became an employee of the Michigan Southern railroad. He made his home in Michigan until the spring of 1859, when on April 1 of that year Mr. Combs landed in St. Joseph, Missouri, going to work on a farm seven miles distant, and in the spring of 1860 he went to Denver via the old Overland road assisting as driver of an ox team, a man who was transporting a number of men to Denver. While in Colorado Mr. Combs worked at placer mining, etc., until the month of August, 1860, when he became an employee of the Overland Stage Company in the capacity of stockman at a relay station of the company situated at Fremont Springs, and October 25, 1862, Mr. Combs became a regular driver on the line from Lone Tree station to Woodriver station; Lone Tree being the original name of Central City, Nebraska. In April, 1863, Mr. Combs and Wallace Burroughs, an old ex-stage driver took a squatter's claim and built a log cabin on the banks of, the Platte river alongside of the stage road, the house being eighteen by thirty-six and raised on April 6, 1863, and in the fall of that year a log barn was erected. This place became a wayside inn. Later on when the land was surveyed by the government, Mr. Combs filed on same, which has remained to this day the home farm. It is located seven and one-half miles southwest of Central City, Nebraska. On the twenty-sixth day of December, 1864, Mr. Combs was married to Miss Fannie Hilton at Lone Tree ranch, which was the homestead ranch of her mother and brother who kept the Lone Tree stage station. Miss Hilton was a native of Maine, the family coming to Nebraska and settling in Douglas county in 1858. Mr. and Mrs. Combs have had three children born to them: Nellie, who is married to Ed Jones and lives in Central City, Nebraska; Frank, married and lives on the old home farm; and Flora, who is married to George Brooks, has five children and lives in Colfax, Washington. In the spring of 1865 Mr. Combs purchased, the interests in the Combs & Burroughs ranch, as he had quit the employ of the Overland Stage Company prior to his marriage. Mr. Combs was the first sheriff elected in Merrick county after its organization, which occurred in 1865. He served in this office during 1866 and 1867. Mr. Combs has always been an active man of affairs, and himself and wife, after a married life of forty-six years, are now enjoying their home to its fullness. Merrick county has but few of hose who came as early as 1862 and still live on their original ranch. The Combs' married and raised their family here, and in their advancing years are still young in spirit if not years. The family is one of the best known in this porton [sic] of Nebraska, and have the respect and esteem of all who know them. On another page of this volume will be found portraits of Mr. and Mrs. Combs. 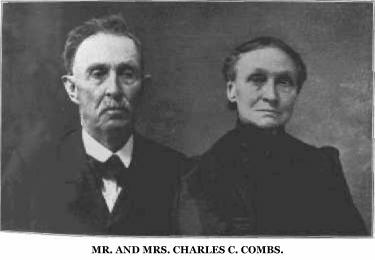 Mr. and Mrs. Charles C. Combs. For over twenty years the gentleman whose name heads this personal history has been associated with the agricultural and other interests of Boone county, Nebraska, and as an old settler and one of her worthy citizens, he was prominently known. When he passed on to the better world, Mr. Brady left behind him the record of good and useful years. James Brady, senior, and family of wife and seven children came to Boone county, Nebraska, March 4, 1884, purchasing a one hundred and sixty acre farm northeast of Albion, and in 1893 he moved to Lincoln, Nebraska, in order to have better school advantages for his daughters; his sons remaining in Boone county. He returned to Albion for residence in 1905. Mr. Brady died in Albion, May 10, 1908, survived by his wife, two sons and four daughters. Mrs. Brady, son, James T., and daughters Mary and Rose, the latter of whom is now Mrs. M. W. McGann, are residents of Boone county; a son, Edward J., lives in South Dakota; a daughter, Catherine, now Mrs. John S. Spear, resides in Stillwater, Oklahoma; and a daughter, Agnes, wife of John H. Van Liew, lives in Beatrice, Nebraska. Louis Langenberg is one of the older residents of Wayne county, Nebraska, and came to that locality when it was sparsely settled, and he had but very few neighbors. His market for disposing of the product of his farm was distant, and he experienced the same difficulties as most of the other early settlers. He is an ambitious and energetic man and has actively pursued the task of improving and developing his land, as well as lending his support to measures for advancing the general progress and welfare. Mr. Langenberg is a native of Lippe Detmold, Germany, born in 1852, and is a son of William and Wilhelmina Langenberg, also natives of Germany. He is one of six children, and was reared and educated in his native country. In 1870, he sailed from Bremen to Baltimore on the steamship Baltimore, whence he removed to Wisconsin and lived eight years in that state. He came to his present home in Wayne county in 1878 and purchased land, which he has cultivated and improved, and now has a valuable estate. He has added to his possessions from time to time as he was able to do so, and now owns eleven hundred acres of land. It was a frequent occurrence to see deer and antelope in the early days, but the old order of things has given place to new conditions and the wild prairie has been transformed into a region of pleasant homes and well tilled fields, the sign of agricultural prosperity and industry. Mr. Langenberg was married in 1880, to Miss Caroline Meyer, a native of Germany, and a daughter of Winand and Caroline Meyer. Mrs. Langenberg came to the United States a few years before her marriage. Nine children have been born to Mr. and Mrs. Langenberg; Rudolph, William, Minnie, Lena, Louise, Annie, Henry, George and Martha, the last named being nineteen years old at the time of her death. The family reside on section twenty-three, township twenty-five, range one, east, Wayne county, and are well regarded throughout the county, where they are well known and have many friends. One of the most prominent farmers of Stanton county, Nebraska, is the above named gentleman, who has been a resident of the county for thirty .years, and has witnessed its development into a thriving agricultural district. Mr. Mortimer has always had the interests of his adopted home at heart, and has remained through discouragements. and dissapointments [sic], and now enjoys a comfortable home located in section fifteen, township twenty-one, range one. Mr. Mortimer was born in England in 1859, his parents being Richard and Elizabeth Mortimer. He remained at home, and received his education in England. In 1879, Mr. Mortimer left his native land and came to America, going direct to Douglas county, Nebraska. He remained here for two years, and then proceeded on to Stanton county, where he bought his present ranch. He added to his original holding as circumstances permitted, and at one time owned considerable real estate in township twenty-one, range one, east. He enjoyed the distinction of putting up the first bit of fence to be seen and the first house in the township. He has since sold a part of his estate, but still possesses enough to make a fine ranch, and one that is well equipped in every way. achieve his ambitions, and with true Anglo-Saxon perseverance, he remained and still worked-and conquered. He has always kept considerable stock, and one of his heavy losses came in 1888, when he lost quite a number of head of cattle in the memorable blizzard of that winter. Mr. Mortimer was married in 1886, to Miss Hattie Porter, of Stanton county, and they are the parents of three children: Richard Honer, Mary Elizabeth and George Arthur, all of whom are living. Mr. and Mrs. Mortimer form an important factor in the social life of the community and are much esteemed by all who know them. In compiling a list of the representative farmers of Antelope county, Nebraska, a prominent place is accorded the name of C. T. Miller. For many years past he has been engaged in agricultural pursuits in Crawford precinct and has done his full share as an old settler towards the development of the better interests of his community, and enjoys the respect and esteem of all who know him. He has a comfortable home on section twenty-nine, township twenty-seven, range five, and is the owner of a good farm, of two hundred and eighty acres. Mr. Miller was born November 12, 1855, in Bradford county, Pennsylvania, and is the son of Thomas and Charlotte V. (Rose) Miller. Mr. Miller's father was a native of Pennsylvania and was born in that state in 1821, and died in 1866. In his life time he followed the occupation of farming. In 1879, Mr. Miller came to Antelope county, Nebraska, from whence he drove to section twenty-nine, township twenty-seven, range five, where he took up and proved a homestead claim, which is his present home. He built two sod houses in the early days, and has since erected a fine home. Mr. Miller has seen many phases of Nebraska life, coming here over thirty-two years ago. In the early days he had to burn hay as there was no money to spare to buy fuel, and they had so far to go after the fuel. In the blizzard of 1888, our subject lost some of his cattle. In 1875, Mr. Miller was joined in marriage to Miss Lodema McConnell, and they are the parents of three children, whose names are the following: Fred, who married Miss L. Morris, they have one child, by name Forrest; Grant, married Ada Hill, and they have two children, by name Mearl and Mildred; and Glen. Mr. and Mrs. Miller are known well and widely, having resided in the one home so many years, and they hold the respect and esteem of all their friends, which are many. They are Methodists in religious belief and Mr. Miller is a democrat in politics. In the gentleman above named we have another one of the sturdy sons of Germany who left his native land and came to this country to help in the steady march of progress. He is one of the very earliest settlers of the northeastern part of Nebraska, having come to this section in 1870, with his parents, who came to America from the fatherland, to seek their fortune, as so many sons of the German Empire have done. Mr. Steinkraus was born January 28, 1855, in the village of Damgard, province of Pommerania, Germany, and is the son of Frederick and Sophy (Martin) Steinkraus, the former born in 1830, and died in 1910; the mother was born in 1832, and died in 1896. On coming to America in 1874, the family sailed from Hamburg to New York, on the steamship "Harmony," and after their arrival came to Omaha, Nebraska. From here they drove to a homestead claim the father had entered two and a half miles east of Norfolk. Here they lived eight years, when in 1882, the father moved to Plainview, where he conducted a store for over twenty years. He retired about 1904, and made his home in Pierce until his death in 1910. On first coming, the nearest market place was at Wisner, thirty miles away, then the terminus of the railroad. Mr. Steinkraus was in Plainview the day of the blizzard of January 12, 1888, and was half way home when the storm broke. After reaching home he spent two hours in the fearful blast, getting his stock into shelter. In 1876, Mr. Steinkraus filed on a pre-emption claim which he later converted into a homestead, in the northwest quarter of section seventeen, township twenty-six, range four, and also a timber claim, where he built a good house, Mr. Steinkraus has always given much attention to stock, breeding Herefords, the herd amounting to two hundred and fifty and upwards each year. Mr, Steinkraus has one thousand seven hundred and twenty acres of good land, forty acres of which is set to a beautiful grove of trees, the pride of the country round. The home place contains ten hundred and forty acres, devoted to stock raising. Mr. Steinkraus purchased a fine residence in Plainview in 1910, and removing there, retired from active business. May 5, 1879, Mr. Steinkraus was married to Miss Emily Ruhlow, who was born in Wisconsin, a daughter of William and Christina (Pasewalk) Ruhlow. Nine children were born of this union, eight of whom are living: Ida, wife of Chris Peterson; Richard, who occupies the Willow Creek ranch; Clara, wife of Stanley Skeen; Emma, wife of Ernst Gast; Erwin, occupying part of the home ranch; Elsie; Arthur, also a tenant on the home place; and Alfred, the youngest. et, and has served his county in the capacity of county commissioner. He holds the esteem and confidence of all who know him. Among the truly self-made men of Howard county, Nebraska, we might mention the name of Jacob F. Hild, who is the only remaining pioneer in his immediate neighborhood. He has been a foremost citizen of the locality from the time of his settlement here, and has given liberally of his time and means in helping build up his county, and state, during the time becoming prosperous and successful on his own account and gaining on enviable reputation as ail active leading citizen of his county. His home is on section thirty-three, township sixteen, range ten. Jacob F. Hild was born in Wurtemberg, Germany, on August 2, 1855, and grew up there, to the age of ten years. In 1865 father, mother, two brothers, two sisters and himself came to America, landing in Lincoln, Illinois, during Christmas week of that year, where another sister was born soon afterwards. The father engaged in farming, and they were getting along nicely, although being poor, when the mother was taken ill and died in the winter of 1868, leaving her six little ones with just the father to care for them. He did the best he possibly could, but often had a hard struggle to carry on the farm and also keep the house going properly. In 1870 he took his family to Kansas, and there engaged in farming in Montgomery county. After a, two years' residence in that section, Mr. Hild also died, and the following year our subject returned to Illinois, and there worked on rented land up to 1890, when with his family he came to Howard county. He had previously purchased eighty acres on section thirty-three, Logan precinct, and shortly after arrival, eighty acres more, and this is still the home farm. He also owns one hundred and sixty acres, about half a mile from this place, all of which is fine soil and most of it under cultivation. He has erected good buildings has a fine orchard, and every improvement in the way of machinery, etc. Mr. Hild was married in Logan county, Illinois to Anna Proehl, in February, 1883. Mrs Hild died in 1894 on the homestead, leaving three children, Fred, who is married, Oscar and Albert all of whom are in Colfax county. In December 1895, Mr. Hild was married the second time, to Mrs. Annie Harris, the ceremony taking, place in Marshall county, Kansas, where she resided. They have two children, Jacob and Minnie, both at home. Mrs. Hild has two children by her former marriage; Mrs. Lillie Bilyen, and Henry H. Harris. Mr. Hild has held different local offices, including that of road overseer, and for the past ten years has been moderator of school district number twenty-one. William J. Timmerman, a leading old settler, of Valley county, Nebraska, who has gained an enviable reputation as a progressive agriculturalist and worthy citizen, resides on his fine farm in section nineteen, township nineteen, range thirteen, where he has a pleasant home. He has been a resident of this locality for the past thirty-one years and is closely identified with the history of the development and growth of the agricultural and commercial interests of this region. William J. Timmerman was born in Montgomery county, New York state, November 17, 1843, and was fourth of eleven children in the family of Jonas and Catherine (Cramer) Timmerman; two of the children died in infancy, and seven sons and one daughter grew to maturity. The Timmerman family were farmers; Jonas Timmerman and family moved from Montgomery county, New York, to Steuben county, New York, in 1847. On August 29, 1864, William J. Timmerman enlisted in Company H, One Hundred and Sixty-first New York Volunteer Infantry, and participated in the engagements at the Siege of Mobile, Alabama, Spanish Fort, and Fort Blakely. He received his honorable discharge September 20, 1865, returning to his home farm in Steuben county, New York. Ransford and Montgomery Timmerman, brothers of William Timmerman, were also in the civil war, the former losing an arm in the service, a ball shattering a bone to such an extent that amputation was necessary. In the spring of 1879, Levi and Montgomery Timmerman, who were brothers, came to Valley county, Nebraska, and in December, 1879, William Timmerman, his brother, Hosmer M. Timmerman, and his brother-in-law, H. P. Eastman, moved from New York state to Valley county, Nebraska. The Timmerman brothers and their families have been pioneers of Valley county, and have had much to do with the development of the county. They have been known as good citizens and stuck to Valley county during adverse years of this portion of Nebraska, becoming prosperous and successful men. Mr. Timmerman was married on March 9, 1864, to Miss Alsemeda Drake in Steuben county, New York, in the town of Jasper. Miss Drake was a native of Steuben county, a daughter of William and Adeline (Gerry) Drake. Mr. and Mrs. Timmerman have had five children born to them, namely: Lina, who is married to J. Cronk, has ten children and is living in Idaho; Edith, wife of William Cronk, has nine children, and resides in Ord, Nebraska; Ernest, who has a farm in Noble township, now occupies the home farm, the parents residing with him; Herman, who is married and living one mile west of the home farm, and has three children; and Clayton, also married, has three children, and lives in Elyria township on his farm purchased in 1910.